The HMI Automatic Vision Alignment System is a straightforward, reliable tool for integrating a computer controlled registration system into your manufacturing process. HMI offers an automatic vision alignment system that allows the printer to automatically adjust the screen to substrate registration with each print cycle. The vision system is integrated with the substrate tooling stage, which becomes motorized to accommodate the incremental adjustment commands sent from the vision system. The vision system is dependent on fiducial recognition. The fiducial can either be a specific image designed as a fiducial, or the HMI vision system can learn a fiducial from a printed image feature using edge recognition and pixel manipulation. Fiducial recognition also requires that the video component of the system be able to see the fiducial, regardless of its material composition or size. HMI offers several combinations of lens, lighting and video modules to ensure that the proper magnification, visual spectrum and pixel resolution are available to make the fiducial visible to the processing system. A unique feature to the HMI automatic vision system is the use a live-printed image for training the system to the screen position. 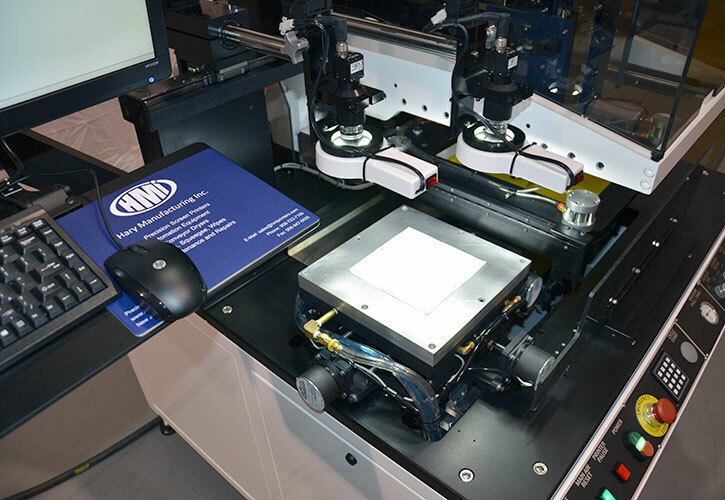 Unlike many vision alignment systems on the market today that use static fiducials on the screen, the HMI automatic vision system uses a printed image of the fiducial image. The printed image contains all the additive tolerance errors inherent in screen printing. Screen stretch, image shift, squeegee drag and many other dynamic properties associated with screen printing are all evident in the live printed image. The training print can be repeated at any time during the life of the screen to take into account the varying registration effects of changing screen conditions, such as tension loss. The ability to adapt to changing screen conditions can help extend the useful life of the screen and reduce overall process costs. Because the HMI vision system uses a live print image, there is no need to require fiducial fill from the screen vendor. Often a source of error due to incomplete filling, irregular fiducial shape or surface projection, screen fiducial fill typically adds cost to the screen. The HMI Automatic Vision Alignment System is is adaptive to lighting and magnification requirements, it contours to alternate design fiducial elements and its image location set point is based on the actual printed imaged of the screen.